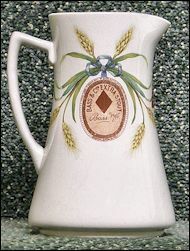 The Association for British Brewery Collectables offers free appraisal and valuation of your breweriana. We will provide information on up to six items of breweriana at no charge. Items must be breweriana, i.e., they must be the product of a brewery. For information on how to get an appraisal and/or valuation of your collectables, just click here. Brewery History Society, Jeff Sechiari, Membership Secretary, Ford Cottage, 9 Clatterford Shute, Carisbrooke, Isle of Wight PO30 1PD. British Brewery Playing Card Society, Mike Johnson, 65 Chandlers, Orton Brimbles, Peterborough, Cambs, PE2 5YW.